"I pay for all." Faith, hope, charity, fidelity. 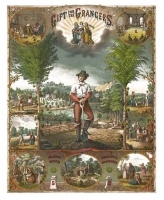 Multipanel poster for Grange members showing scenes of farming and farm life.